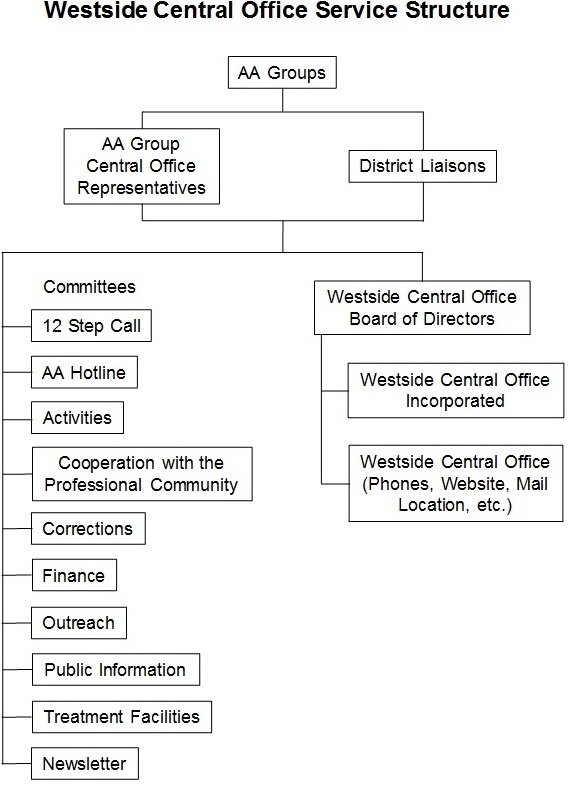 A graphical depiction of the Westside Central Office (WCO) service structure is shown above. Note that the A.A. Groups are at the top of the chart. In other words, the groups are the ones that are in charge of the overall WCO service structure. The A.A. Groups control the purse strings and participate in the decision making of the WCO. Each A.A. Group participates in the decision making process by electing a Central Office Representative (Co Rep). A Co Rep serves as the liaison between the group and the WCO service structure. Decisions that affect the overall WCO service structure are made at each monthly WCO Business Meeting. Co Reps attend these business meetings on behalf of their group and get to vote on measures (a.k.a. motions) that affect the overall WCO service structure. Co Reps also get to elect service volunteers into the roles of WCO Board of Directors and WCO Service Committee Chairs. Many A.A. Districts have a District Liaison service position. A.A. Groups typically elect District Liaisons at their District business meeting. District Liaisons serve as the voice between their District and Westside Central Office. The WCO Board of Directors serve as the legal custodians of Westside Central Office, Inc. and oversee the day-to-day operations of the Westside Central Office. The Service Committee chairs organize and lead the various service committees. Service Committees perform the necessary 12th step work of the Westside Central Office (WCO). Below is a summary of each service committee at the WCO. Stop by a business meeting or contact us to learn how you can get involved with these committees. Organizes, runs, and promotes all service workshops and social activities of the Westside Central Office. In charge of the Information Technology (I.T.) aspects of the Westside Central Office (WCO), including the WCO’s website, email accounts, telephone number, etc. Maintains contact with A.A. groups in order to inform the groups of the Westside Central Office (WCO) function, to encourage participation with the WCO, to promote general cooperation between the WCO and individual groups, maintains and updates the WCO F.A.Q. form and other information documents. Publishes the Westside Central Office’s monthly newsletter Into Action!